The survey was conducted in August 1994 by the Department of Fisheries and Wildlife, Michigan State University - Dr. Niles R. Kevern, Nanette Kelly, Pat Kelly, Kristi Klomp, JoAnna Lessard and Bruce Peffers. Fumee Lake and Little Fumee Lake (Forest Lake) are connected by a channel and a culvert. The outlets for each lake are on their southern edges and they converge to form Fumee Creek. There are several springs and creeks that flow into Fumee Lake. The largest is located at site B on figure 1. There is a spring flowing into the north side of the lake located at site C on figure 1. A number of artesian wells are located near sites B, D and E on figure 1. Two additional artesian wells are located in the swamp at the west end of the Indiana Mine at sites F and G on figure 1. The water from the swamp flows into the northwestern edge of Fumee Lake. ​The maximum depth of Fumee Lake is only 12 feet. Over half the lake is only 5 feet deep. The lake bottom is covered by a light colored flocculent material which remains suspended in the water column if disturbed. This sediment appears to be unconsolidated and low in nutrients since aquatic vegetation is notably sparse. 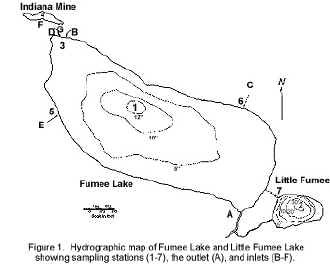 Little Fumee Lake is much deeper than Fumee Lake. The deepest part of the lake is over 30 feet ( see figure 2 for depth comparison). The sediments of this lake are darker colored and more typical of decaying aquatic vegetation. Fumee Lake is so shallow that it does not stratify. 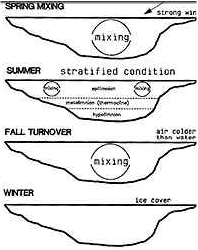 Stratification or layering is a process in which water's density is affected by temperature. Water is most dense at 39o F (4 o C), becoming lighter (less dense) as it warms. In the spring and fall, the temperature of a lake is uniform. This allows for easy mixing of the water from top to bottom. This happens by the water on top cooling and sinking while warm water from the bottom rises to replace it. This mixing is important in re-oxygenating the water and circulating nutrients. In the summer, the warm water on top is separated from the cold water on the bottom due to differences in density.